Authored by seasoned construction professionals, UDA Green Building Specifications provide detailed definitions of construction methods, materials and finishes that should be included with every construction contract to fully define the scope of your agreement and reduce misunderstandings between contractors, owners, buyers and building officials. Packed with over 300 categories of conventional and 74 categories of green building specs based on the CSI MasterFormat, UDA Construction Specifications make it easy to ensure clear communication with your customers, suppliers, and subcontractors. Designed for both conventional and green building projects, UDA Green Building Specifications include over 490 pages of green building materials and methods to inform you and your project team of the best-case practices used in environmental friendly and sustainable construction. UDA Green Building Specifications give you the tools to easily create professional quality construction specifications without spending hours wading through 100's of categories of nonapplicable options. For convenience, we have assigned classification codes that correspond, whenever possible, with the section headings and numbering system of the Construction Specifications Institute's Masterformat. UDA Green Building Specifications also include tables which can be filled-in to reference specific plan and finish schedule notes, (such as window or door types) to tie your contracts, specifications and construction plans together. 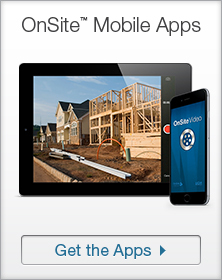 Get started today by downloading Construction Specifications immediately. Protect your bottom line with comprehensive specifications to ensure that your estimate covers the entire scope of the project. Effortlessly define methods, materials, and finishes to ensure that the project is completed according to your standards and expectations. Establish complete agreement and project understanding with your clients, vendors, and subcontractors with clear and accurate specifications. Start with construction specification templates for Residential or Property Development and customize to fit your project needs. 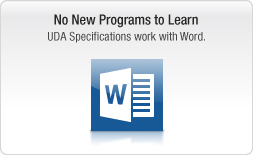 Preview, edit, and customize specifications directly in Microsoft Word or other word processors. Create templates to reuse specification sets for each project type. 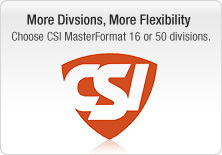 Choose between the CSI MasterFormat 16 Division or the CSI MasterFormat 50 Division format to produce detailed specifications for each of your projects. 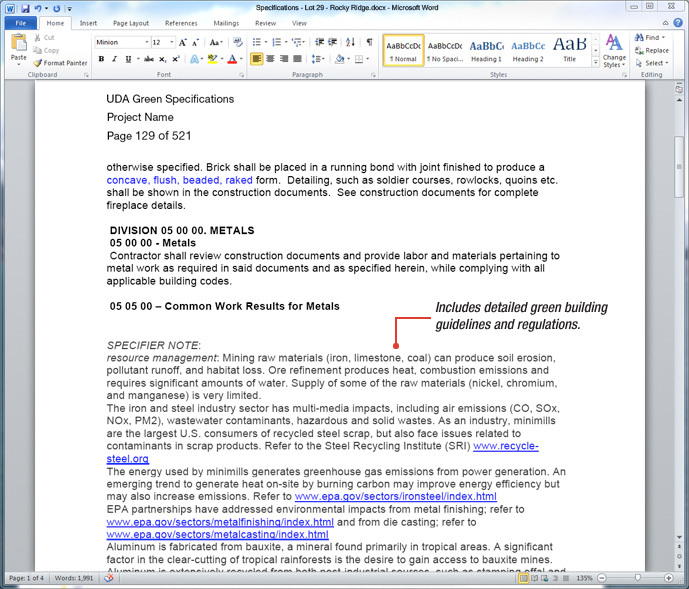 UDA Green Building Specifications are fully editable word processing documents that can easily be customized to meet your specific project needs or client concerns. Additionally, by not limiting the number of times a UDA Specification or Form can be used or printed, these documents can grow and change with your business for years to come, providing the essential components neccessary for successful project management. UDA now offers 34 popular Contract Bundles as well as a complete Contract Templates package of 135 construction contracts and forms. Available for purchase and immediate download, these files can be fully customized using any word processor such as Microsoft Word, Works, or WordPerfect. 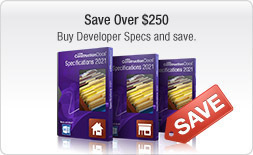 Contract Bundles range from $9.95 - $23.95, and the complete Contract Templates package is available for only $79.99. 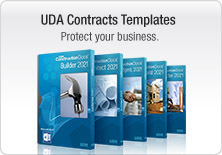 Implement UDA Construction Specifications as part of the complete ConstructionSuite system, and take control of project management with advanced construction Estimating software, critical-path Scheduling, dynamic QuickBooks Integration, and a comprehensive library of professional Contracts, Forms, and Templates. Not all products include every feature described above. Refer to the Compare Specifications Products web page to view a comprehensive list of features included in each product. Microsoft Office, Microsoft Project, and QuickBooks are not included with Contract Templates or ConstructionSuite. ConstructionSuite and ConstructionNet are trademarks of UDA Technologies, Inc. RS Means, RSMeans, and MeansData™ Costbooks are trademarks of Reed Construction Data. 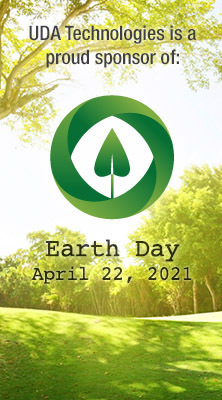 Copyright ©2003-2018 UDA Technologies, Inc. All Rights Reserved.